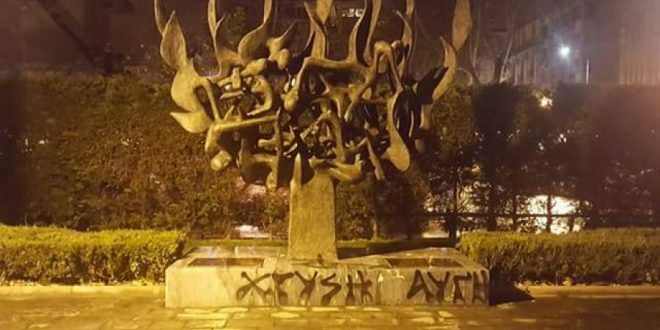 Apart from the attacks against two squats in Thessaloniki yesterday, fascists also vandalized a holocaus memorial in the Greek city. A billboard with jewish and muslim religious symbols was also attacked. Today there will be an antifascist demonstration in Thessaloniki. Image: Vandalized holocaust memorial in Thessaloniki. Yesterday we reported about the fascist attack against two squats in Thessaloniki. The Libertatia squat was burned down by fascists during one of the attacks. The Libertatia collective published a stattement in which they also call for an antifascist demonstration which will take place today. People will start to gather at the Libertatia squat at 06:00pm local time. But not only the squats were attacked. During yesterdays demonstration of nationalists and fascists a banner with religious jewish and muslim symbols was also attacked and later teared down (Image below). On Sunday night the holocaust memorial in Thessaloniki was vandalized with slogans of the fascist Golden Dawn party and a celtic cross. The Holocaust Memorial in Thessaloniki is a sculpture of flames with a grid of people. It was made by the Glif brothers in 1997 and is dedicated to the 50,000 Jews of Thessaloniki who perished in the the Nazi camps during the second World War. It was not the first time that the holocaust memorial has been vandalized in the capital of the Macedonian region of Northern Greece.